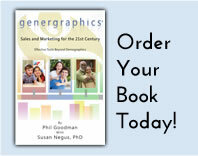 Generation Miner, created by Charles Schwartz, is a suite of tools that join the power of Genergraphics® and behavioral research with generational marketing. It takes into account differences in life experience that shape the values of each generation -- differences which profoundly affect the way their members live and consume. It gives the marketer a handle on what products and services baby boomers, gen-xers, and other generational groups buy and why they buy them. Generation Miner goes beyond simple generational differences. It identifies subgroups within each of the generations -- groups that share many values and attitudes with others of their generation, but whose members may have different purchase patterns and consumer needs. • Position your product to reach new age groups by appealing to their core values and needs. • Determine future demand in a dynamic marketplace as baby boomers mature and generation x'ers enter their prime earning years.